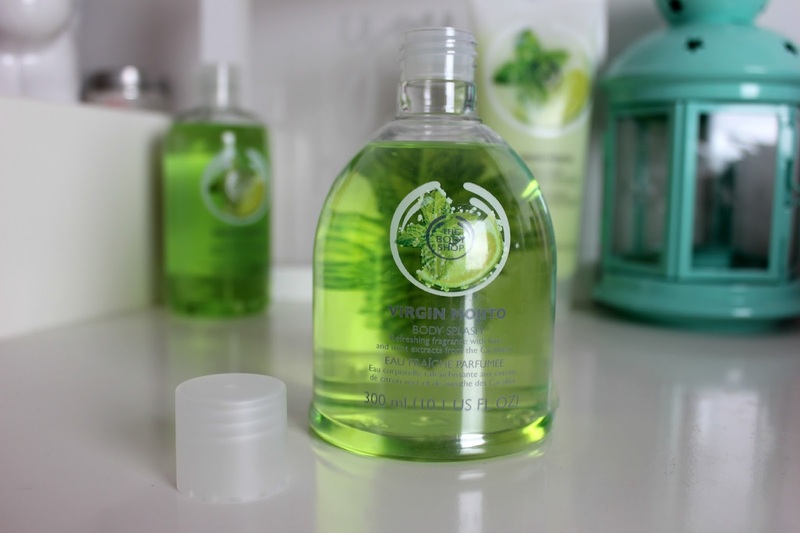 The Body Shop have just launched their brand new Summer special edition scent, Virgin Mojito! I love a Mojito so I had to get my paws on it. But really who can say no to a Body Shop Mojito! With its scent based on the popular cocktail, its a fresh lime with a hint of mint fragrance, inspired by the Caribbean! The collection itself is a little bit smaller than previous collections that they've launched recently. It contains five products, including one new product venture for the brand! Ive only picked up three, but you can also get one of their famous Body Butters and a jelly like Body Scrub! Firstly of course there is a Shower Gel in the range, which comes in either the standard 250ml size or a travel miniature 50ml size in stores too. The Body Shop Shower Gels aren't drying on the skin and lather up really well with the littlest amount of product. I found the scent lasted well on its own, but lasts even better if paired with other products in the range. Probably one of my favourite types of product that the Body Shop offers is their Shower Sorbet. Especially in this scent it is a must to pick up! The Sorbets are packed with moisture and are light in texture, I prefer these in the summer over body butters as they're cooling on the skin, but offer the moisture too. Even though it isn't specifically targeted as an after sun solution, its one of the best things to put on after a day in the sun. The new venture for the Body Shop in this range is their Body Splash!It is a fragrance, just with a difference, mainly being that there is no spray top to it. Which looks like its going to be really messy, which actually it can be. But if you shake a little bit of this on after a shower or after you've moisturised too, it prolongs the overall scent of the fragrance. Its light and refreshing and very fast drying on the skin. Plus if you cant get the hold of the sprinkling technique, I'm not sure I can! These pour quite easily into a travel spray bottle too. I really recommend the Body Splash and Sorbet from the range, I just overall recommend popping into The Body Shop and giving it a really good sniff! Im now eyeing up the Body Butter and Scrub too. I still need to get a summer shower gel to leave me feeling cool and refreshed! Next time I'm at The Body Shop, I'll look for the mojito shower gel! This range looks so pretty! I bet they smell amazing, I can't wait to have a look next time i'm shopping! Will have to keep an eye out for these next time i go body shop, i bet they smell good! They seem to be soo nice! Gonna have to get my hands on one of them very soon! i love mojito so i am so excited abut this collection! i really want to get the body sorbet! Every blog I read seems to be talking about this range! I'm going to have to give them a go! Soooo want these! Intrigued to try the sorbet as it sounds good enough to eat! Lol! That scent sounds amazing! I need to try it out!